Download TFTPBoot.exe(154MB) (mirror) and save it somewhere convenient or order everything you need on a CD. Open the tftpboot folder and double-click on tftpd32.exe. Press “OK” to return to the main window. Click the “DHCP Server” tab. Disable any firewalls (including Windows’ built in firewall) on the computer with Tftpd32. 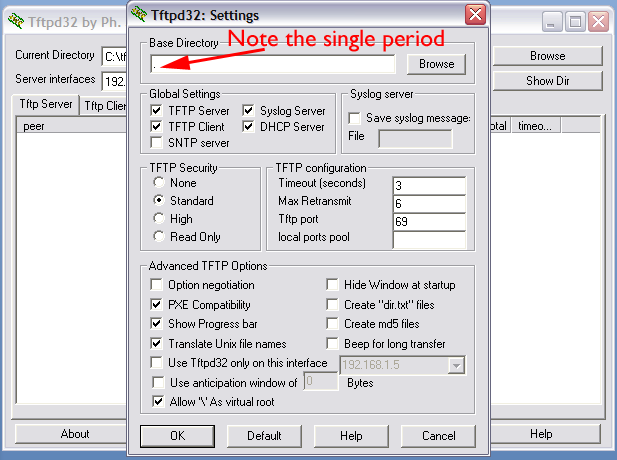 Set the network adapter on your computer to have a static IP address of 192.168.1.5 (for details on how to do this, click here). Turn on the computer you are trying to boot, and select the option to boot from the network (called PXE). The method varies from computer to computer, but generally you tap one of the function keys (F12 for example) right after turning the computer on. You will then see a message asking you to press F12 to continue booting from the network. Quickly press F12. Windows PE will now load. It may take some time, but eventually you will be presented with a command window (black box with white writing). DO NOT close tftpd32.exe or disconnect the crossover cable. *Later version of TFTPd32 contain more options than seen here. These additional settings may allow the TFTP process to work with a wider range of computers, but may also introduce problems. For example, those that contain a “DHCP Settings” section need to have all of the DHCP options unchecked to work. If you choose to use a version of TFTPd32 other than that which comes in the package from this page, you’ll need to experiment with all the settings. You are now in Windows PE and can do what ever you need to do including formatting disks. If you want install an operating system, keep reading. Put the operating system installation CD in the same computer as Tftpd32 is installed on. Share the CD-Rom drive (how you accomplish this varies by Windows version). Give it a share name of “CD” and make sure “Everyone” has read permission for it. You will be prompted for a user name. Type, “\192.168.1.5\User Name” replacing “User Name” with the name of a user account on the computer with the shared CD-Rom drive. You will then be prompted for a password, enter the password associated with the user name you used above. You should see “the command completed successfully.” Type “y:” and press enter. Type “setup” and press enter. The setup program on the CD will then load and you will be on your way to installing a new operating system. While the new OS is installing, be sure to not remove the Ethernet cable or the installation CD. Once the installation is complete, revert any changes you made to your computer: stop sharing the CD-Rom drive, re-enable your firewall, and reconfigure your network adapter to the IP settings it had before. PS: If you are installing Windows Vista on your M200, you will need some special drivers. These can all be found on the web, but since I already have them all downloaded and tested, I’d be happy to send the drivers to anyone who wants them for the cost of a CD + shipping or a few bucks for a FTP transfer. If you are interested, just visit the store. I’ve got an M200 and thanks to your wonderful instructions I’ve managed to reinstall windows. However, on the last step (step 5) you wrote to “type ‘y:’ and press enter”, but this did not work as I got an error saying “The system cannot find the path specified”. Instead, I managed to access the setup (after completing step 4) by typing “\\192.168.1.5\cd\setup.exe”. Once again thanks for the great post! *Edited by Ryan Adams for clarity. What you did should work 95% of the time. I have gotten to boot into PE. I’m trying to do the reinstall from my Recovery Disk over PXE. I have an install.bat file that i’m using, but when i run it it states ‘XMSDKS’ not recognized as an internal command and then it can’t find ‘tghost.exe’. I’ve copied the /base directory and am initilizing the the BAT find from the /base so the files there, but i can’t get it to load. Any ideas on how to get it to load from the Recovery Disk? After unsuccessfully trying to boot both from SD and another PXE-guide I finally had some success with your guide! However I do not have a functioning CD-rom on my “server” so I have to use images instead and when I try to install windows (XP in my case) they option to install is grayed out (meaning I cannot install). Any idea on what causes this? Again, thanks for a great guide. @ Jamie Lenz: “XMSDSK” is a ram disk creating program. It allocates a part of your RAM as storage space for files and assigns the space a driver letter. I’ve never used the recovery disks you mentioned, so I can’t be sure, but it sounds like the batch file may not be pointing to the XMSDSK file correctly. Try opening the BAT file and changing any references to “XMSDSK” to “XMSDSK.exe” and insure this file is in the same directory as the BAT file. @ Filip: I’m not sure what your problem is. I’ve only seen this happen when the Windows installer can’t find a hard drive to install to. I doubt it is related to using an image of the XP install CD (unless of course it is some “customized” image as is common on torrent sites). heck the bios on your M200 and make sure the hard drive is seen. 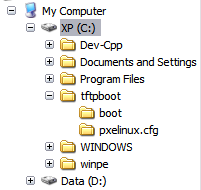 Also, try using the Windows XP recovery console to see if you can see/format the drive. Finally, you may try calling Microsoft, as they offer free installation support (just don’t mention the crazy duct-tape setup you are using to access the CD). The Tftpd32.exe supplied in the zip file didn’t work with my Portege. However, the lastest version from http://philippe.jounin.net/tftpd32_download.html worked perfectly (after copying the new tftpd32.exe into the c:\tftpboot folder. Thanks for this page, it has saved me loads of time! Damian » Thanks for noting that. I have updated the ZIP file to include the latest version of Tftpd32.exe. I was successfully able to boot into Windows PE, but I can’t get “net use” to work. I should mention that I am over a router, and I’m 99% sure that’s causing the problem. Without getting a x-over cable, is there any way to get net use to work? George Wang » You might try connecting your two computers together with a straight through cable. Some computers have auto sensing network cards which will work with a strait or crossover cable. Are you able to ping the computers? Hi Ryan, Ive only got pxe to boot up to a point, it gives me a (PCI detection has not found a listed pci adatpter. Switching to manual.) I can see none of these drivers that matches my own. can i put the drivers in a directory or pack them up so pxe can see the network drivers? Wonderful thanks for the link and thanks for your help! Thank you for the nicely written tutorial. Everything worked perfectly on the first try.